I was lucky enough to get an early copy of Intisar Khanani's Memories of Ash back in May when it was first released. I really love Khanani's work, and I fully intended to sit down and read the book as soon as I received it. But things do not often work out as well as you wish, and I never got around to reading this book until over the Christmas long weekend. This ended up working out for the best, though, as I had precious hours in a row to devote to reading and became fully enmeshed in the story. Memories of Ash picks up about a year after Sunbolt ends. It's been well over two years since I read Sunbolt and I admit that I was foggy on some of the details (and, er, major plot points). 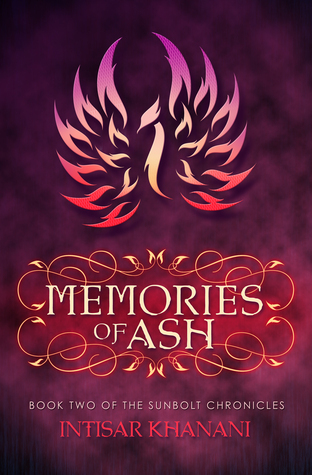 I highly recommend that you read Sunbolt before you read Memories of Ash, and if you are the type to re-read when a new book in a series comes out, I recommend you do that, too. I rarely do that and rely solely on memory and chutzpah to get me through, and usually it works fairly well. Anyway, Memories of Ash begins with Hitomi living a quiet, peaceful life in the country with an older mage, Brigit Stormwind, who is teaching her how to hone her magical skills. But soon people come for Stormwind, accusing her of treason and other trumped-up charges. Stormwind is taken away; Hitomi leaves soon after to go and save her. The rest of the book follows Hitomi as she sets out to accomplish this very difficult task. One of the greatest things about Khanani as an author, at least to me, is that she rewards her characters for being good people. So often in fiction, people are shown to be unkind or vindictive or two-faced or untrustworthy. In Khanani's books, people are shown to be kind and supportive. They may have different priorities or goals, but they listen to each other and attempt to understand motives. At a time when it feels like people just talk past each other and don't really listen and are not willing to hear anything they don't want to hear, I cannot express how much I treasure this aspect of Khanani's work. We learn more about Hitomi's past in this book, and while that knowledge adds intriguing depth and great promise to this series, Hitomi herself remains loyal, steadfast and honorable in light of everything she finds out. She's a pretty great lead character, so it's no surprise that she makes some really wonderful friends. In reading this book, I also understood why Khanani spent so much time writing and editing it. Not only has she constructed a beautifully intricate world and peopled it with a diverse and fascinating cast, but she's also given all of them rich cultural backgrounds and hinted at more to come. There are a lot of politics at play here and Hitomi has to navigate all of that in addition to trying to meet her own goals. She has so much empathy for people, and because of that, she really tries to understand what motivates them and what would make them believe her and help her. If this sounds like manipulation, then I am not describing it well. Hitomi does not pray on people's fears or weaknesses, she looks for common ground. And this is one of the reasons I love some types of fantasy and really hate others. I prefer the premise that people are good and can see some of themselves in others, that power is a privilege that should be wielded fairly and with integrity. I don't like fantasy that implies that as soon as someone gets power, that person becomes corrupt and savors violence or cruelty (especially towards women). I appreciate that Khanani seems to have that same vision; most of her characters are kind and strong and stand up for what's right, even the ones with smaller roles. And that means a lot. So even if it takes another two years for the next installment in this series to come out, I'll count it worth the wait if it continues this excellent trend. I need to check out more books by her! I keep meaning to, but then something else comes up. I want to be that type of reader, the type who rereads all the series books when a new one comes out. But I am never that organized/dedicated/disciplined (or, whatever the word is, or combo of words). This sounds like a great series. Really. I do not typically reread books when a new title in the series comes out. I always intend to do it but then I run out of time and assume I'll be able to figure it out. I totally still feel like I can figure out Memories of Ash. I CAN DO IT. I remember the teacher! The guy Hitomi rescues brings her to the teacher!